August/September: In the summer issue of Educational Dealer Magazine Order Out of Chaos’ Academic Planner was highlighted in the Fabulous Products column. July 14, 2017: Leslie was featured by Bed, Bath and Beyond in the article Top 10 Things College Students Forget to Pack. March 2017: Leslie’s book, What’s the Deal with Teens and Time Management was mentioned in the “Recommendations, Reviews & News” section of ADDitude Magazine. July 24th: Order Out of Chaos’ Academic Planners were featured in the Long Island Newsday’s Back-to-School Product Guide. September/October 2015: The Academic Planner – A Tool For Time Management® was featured in the fall Back-to-School issue of Calgary’s Child Magazine. September 24, 2015: 3 Partners in Shopping; Nana, Mommy, &; Sissy too! presented What’s the Deal with Teens and Time Management: A Parent’s Guide to Helping Your Teen Succeed by Leslie Josel Blog Tour . September 23, 2015: The Children’s and Teens’ Book Connection presented Interview with Leslie Josel, Author of What’s the Deal With Teens and Time Management? September 16, 2015: As the Page Turns presented Interview with Leslie Josel, author of ‘What’s the Deal With Teens and Time Management’. September 9, 2015: Leslie was a guest blogger on The Writer’s Life eMagazine with Dear Reader by Leslie Josel. September 2, 2015: Leslie contributed to an article for the Associated Press entitled, Should Kids Make Their Beds? It Depends. September 2, 2015: The Story Behind What’s the Deal With Teens and Time Management by Leslie Josel was published on theStoryBehindTheBook.com. September 1, 2015: Leslie’s book What’s the Deal With Teens and Time Management was featured on ImShelfish.com as part of the Pump Up Your Book tour. September 2015: Leslie Josel and the Academic Planner – A Tool For Time Management® were honored to be featured in an exclusive Back-to-School article in Family Circle Magazine. August 27, 2015: Leslie was featured in the article Top 10 back to school tips in the LoHud Journal News. August 2015: Leslie’s article, “Homework Station 101: Help your little whiz ace those fractions with tips from organizing expert Leslie Josel” was featured in the August issue of Delish Magazine. April 8th: Leslie hosted a Twitter Party for Smart College Visit (they make it easy for college-bound teens & parents to search for colleges) to discuss Teens and Time Management at 9:00PM EST. Join Leslie on Twitter using #CampusChat. April 1st: Leslie’s book “What’s the Deal with Teens and Time Management” was featured in the lifestyle section of Wilmington, Delaware’s The Wilmington News Journal. November 2014: Order Out of Chaos and their “Academic Planner: A Tool For Time Management” was featured in the “EndCap” column in the November issue of Educational Dealer Magazine, the trade publication for people who sell school supplies to teachers, parents and schools. August 1, 2014: Leslie is featured in the Bookazine “The Ultimate Back-to-School Guide ORGANIZE! 200+ Tips and Tricks!” Check out your local Target, Barnes and Noble or Walmart to find your copy. August 1, 2014: Leslie, Order out of Chaos and The Academic Planner are featured in the Associated Press article “Back-to-School Help From Professional Organizers.” Check your local papers for the Back-to-School supplement. April 2014: Leslie was featured in a Spring organizing roundup article in Serendipity Magazine. November 1, 2013: Leslie recorded a webcast for PlayDHD on using “External Communicators” to get more done when living with ADHD. Click here to watch. October 2013: Leslie is a contributing expert for Next Step Academy’s “Time Management” online course for teens and college students. 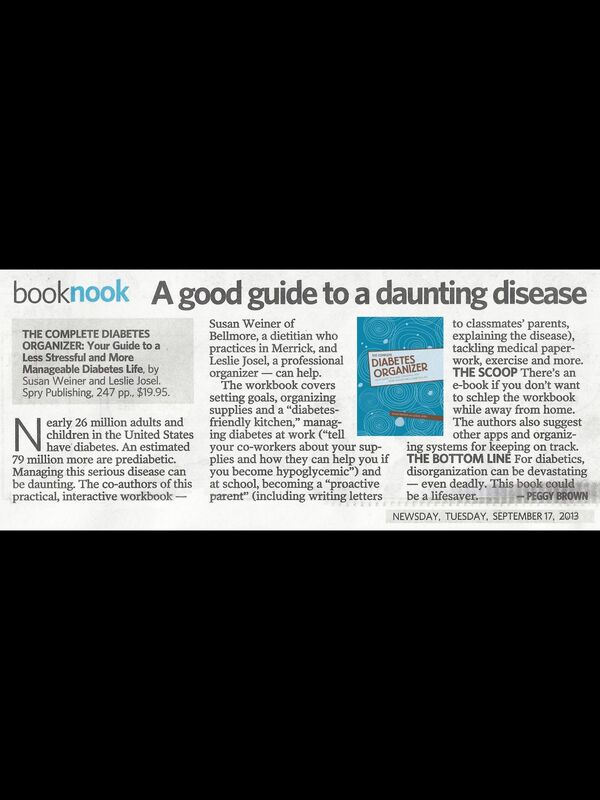 September 17, 2013: Leslie’s new book, “The Complete Diabetes Organizer” was featured in Long Island’s Newsday Newspaper. Click here to see the review! August 23, 2013: Order Out of Chaos’ Academic Planner was featured in Better Homes and Gardens’ Storage magazine in a back-to-school article on students’ learning styles. May 15, 2013: Leslie and Order Out of Chaos was featured in “My 365 Online Lifestyle Magazine“ See page 32! May 2013: Leslie’s article on “Time Management for Students with LD” was featured in the May issue of Smart Kids with LD. May 2013: Leslie was featured in “Woman’s World” magazine’s weekly feature “Your Perfectly Organized Life” providing tips to organize teens. February 2013: Leslie was featured in Girl’s Life Magazine in an article about “Time Management for Tweens”. January 21, 2013: Leslie’s tips for “Organizing with Post-Its” appeared on SheKnows.com. September 2012: Our Academic Planner was highlighted in the Back-to-School issue of Family Circle magazine as the favorite planner to go back to school with. Check out page 36! September 2012: Leslie’s 10 tips for “Organizing for Your Senior Year in High School” appeared in NextStep U Magazine. Summer 2012: Leslie was featured in Westchester Home Magazine’s “Second Look” column offering ideas for re-purposing household items. July 6, 2012: Leslie was featured in an article in the New York Daily News discussing her upcoming episode of “Hoarding: Buried Alive”. June 12, 2012: Leslie was featured in an interview about her participation in “Hoarding: Buried Alive’s” hour-long season premiere in the Health section of FoxNews.com. See the full article here. March 2012: Leslie and Order Out of Chaos was spotlighted in the “Reinvention” section in MORE Magazine. February/March 2012: Leslie’s article “The Power of Connection at Conference” was in the February/March issue of the Institute for Challenging Disorganization’s “The Chronical.” Download and read the issue here.